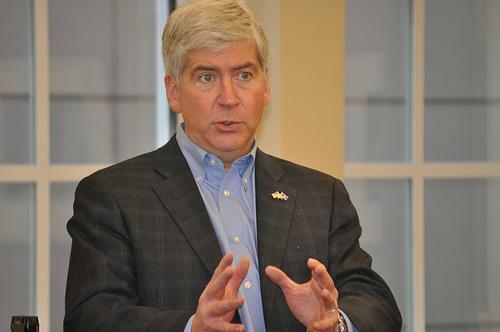 Governor Snyder and other leaders talked immigration and Michigan’s economic future at a conference in Detroit. Organizers say they want to change the conversation about immigrants and the economy. They maintain immigration is a key driver of economic growth. Former Detroit State Representative Steve Tobocman leads the pro-immigration policy group Global Detroit, and spearheaded a study that outlined how Michigan’s economy benefits from immigration. He says immigrants are more likely to be entrepreneurs—and in Michigan, they’re more likely than others to be college-educated. He says the state already has some other big advantages, too. Tobocman says he hopes the conference will promote a more positive view of immigration, and spur Michigan to become a more immigrant-friendly state. Governor Snyder says the state needs to do more to attract immigrants, and get them to stay once they’re here. And Snyder says Michigan needs to get over what he calls its “shrinking pie” mindset about immigrants, the economy and jobs. An incoming University of Michigan student has taken her fight against being deported to Washington D.C. Ola Kaso testified before a U.S. Senate committee in favor of the Dream Act. The bill would allow the children of undocumented immigrants to stay in the U.S. to pursue their educations. Kaso says she has tried to take advantage of the education opportunity given to her, an opportunity now threatened by deportation to Albania.